Compare Golf Club Sets for Beginners: Callaway, Wilson or Pinemeadow? This article is intended for people who are planning to start playing golf and want to equip themselves with a good and affordable club set that will make introduction to golf an easy and pleasurable activity and that will be sufficient for a very long time to come. We will compare here three of the best and most popular golf club sets bought by Amazon customers many of whom have provided raving reviews. They are the Callaway STRATA Ultimate, Wilson Ultra and Pinemeadow NITRIX Pro club sets which are particularly recommended to beginners with serious intention of learning how to play golf. These club sets were designed to improve your game if you struggle with some of the basic techniques and help you over the learning curve. You can expect to use these golf club sets for a very long time before you will need to add any additional clubs or replace existing ones. Note that these were not just among the most popular among Amazon customers at the time this article was written, but they had also received excellent reviews from most Amazon buyers (an average rating of at least 4 stars each, out of 5 stars!). Before we proceed with the comparison, it makes sense to clarify some of the basic golf club terms used below. But if you are in a hurry and wish to see right away Amazon price information for these golf club sets, please click: Selected Golf Club Sets on Amazon. WOODS are clubs that have a long shaft and a large head. They are used to propel the ball a long distance. Woods are numbered in ascending order starting with the DRIVER (or 1-wood) which has the lowest loft (mostly between 9 and 13 degrees), and continuing progressively with higher numbers and higher lofts. Note that woods can achieve very long distance tee shots. Woods with higher numbers and lofts than the driver are referred to as FAIRWAY WOODS, because they are used for shots from off the turf of the fairway that can still be considered as long distance shots (fairway being the part of the course where the grass is cut short between the tees and the putting green). Fairway woods usually have slightly shorter and stiffer shafts and smaller club heads than the driver. Note that most common modern club sets include only one fairway wood, the 3-wood, while some club sets also include the 5-wood for players who prefer fairway woods to long irons for play through the green. In the past, these clubs had their heads made of hardwood, which explains the name. But nowadays, most woods are made of graphite. ​IRONS have a shorter shaft and a metal head that presents an angled flat face often scored with grooves. Though, in the past, their clubheads were forged from iron, nowadays iron club heads are investment-cast from a steel alloy. Irons of varying lofts are used for a variety of shots from virtually anywhere on the course, but most often for shorter distance shots approaching the putting green, or to get the ball out of tricky situations such as sand traps. There are two categories of irons. Those that are in the first category are numbered from 1 to 9 indicating the relative angle of loft on the club face. Irons that are in the second category have higher loft than the numbered irons and are called WEDGES, which are typically marked with two letters, and are used for shots requiring short distance and high launch angle. The most common wedges are the PW (PITCHING WEDGE) and the SW (SAND WEDGE). The pitching wedge is used to hit shots with higher and shorter trajectory than with a 9-iron. The sand wedge is designed for use around sand bunkers which are depressions filled with sand. It provides a large amount of bounce, enabling the club head to glide through the sand and avoid getting stuck. HYBRIDS can be viewed as a cross between woods and irons. They are usually used instead of the low-lofted irons to provide similar distances, but a higher launch angle. PUTTERS are low-lofted, balanced clubs designed to roll the ball along the green and into the hole. The following table compares the main features of the three selected golf club sets (please read the table notes that follow for a thorough understanding of what is offered by each set). Note: The specifications provided in the table and the following notes are for Mens's golf club sets. For women's club sets specifications, please refer to the Amazon section below. One 12 ° DRIVER with headcover included. Two FAIRWAY WOODS : #3 and #5 with headcovers included. Two HYBRIDS : #4H and #5H with headcovers included. Six IRONS: #6, #7, #8, #9, PW and SW.
One PUTTER with progressive mallet shape to provide high accuracy. One 10.5° DRIVER with headcover included. One FAIRWAY WOOD: #3 with headcover included. One HYBRID: #4H with headcover included. Six IRONS: #5, #6, #7, #8, #9, and PW. One PUTTER with weight-balanced head design and alignment grip that improves consistency for a better putting stroke. A DRIVER with head cover included. A FAIRWAY WOOD: #3 with head cover included. A 24 degree HYBRID and five IRONS (#6/#7, #8, #9 and PW) all featuring wide soles for better accuracy at any distance. Woods are made usually of graphite (or graphite combined with titanium), while hybrids, irons and putter are made of steel. "Flex" refers to the ability of a golf shaft to bend as forces are applied to it during the golf swing. There are a number of ratings for shaft flex. For beginners, shafts with Uniflex or Regular ratings are recommended. All three golf bags are equipped with compartments on the inside and pockets on the outside. All three golf sets considered here are available for right and left handed players. When you click the Amazon product links below, you will be offered both right and left handed models to choose from. Club sets from all three brands made specifically for ladies are available and presented below in the Amazon products section. The Amazon prices listed were in effect at the time this article was written and may have changed. For exact prices please refer to the Amazon products section below. Note that the Amazon Price often includes a generous discount on the List Price (which will also be shown whenever a discount exists). So which club set to get? The 18-piece Callaway STRATA Ultimate club set comes with everything you need to play (12 clubs: Driver, 3W, 5W, 4H, 5H, 6i-PW, SW and putter, headcovers and bag), without having to pay the thousands of dollars that custom club sets demand for the same club content. It is great for beginners, but even experienced players who don't get out to the golf course often enough to justify a very expensive set will find this club set more than adequate. So, if you can't justify spending thousands of dollars for a custom set, Callaway STRATA Ultimate has the quality and feature set that will respond to your needs both as a beginner and a more seasoned player. It also comes with a 2-year warranty as opposed to most sets that come with a 1-year. Note that Callaway also offers a more affordable club set that comes with fewer clubs but similar quality and features found in the Callaway STRATA Ultimate set. It's the Callaway STRATA Complete. The men's set has 12 pieces of equipment: 9 clubs (driver; #3 fairway wood; #5 hybrid; #6, #7, #8, #9, PW irons and putter), 2 headcovers and 1 bag. 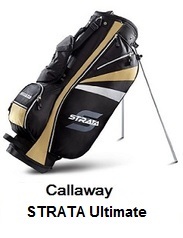 Both Callaway STRATA Ultimate and Callaway STRATA Complete are offered below in the Amazon products section. If you want to save some more money, you may want to consider either the Wilson ULTRA or the Pinemeadow NITRIX. They come with slightly fewer clubs (10 for the Wilson ULTRA and 9 for Pinemeadow NITRIX), but they are perfect for the beginner, and given their low price, it makes no sense to purchase really expensive clubs if you're not a professional or competitive golfer. At the time this article was written, both the Wilson and Callaway clubs sets had received a slightly better rating than the Pinemeadow club set from Amazon customers (4.5 stars for the Wilson and Callaway club sets and 4 stars for the Pinemeadow, out of 5 stars). As a beginner, buying one of the above three club sets makes a lot of sense as paying thousands of dollars is a ridiculous investment for new players yet to discover their gaming tendencies and needs. Once you have played for sometime and determined which are the clubs you're not completely happy with, you can start slowly replacing them with custom versions, but you can be sure that most of the clubs that come with these sets will stay in your game for quite some time to come. When you click the Amazon product links below, you will be transferred to the Amazon.com site where you can get exact price information or shop safely for the product or products of your choice. You will find below the three men's golf club sets compared above. Club sets with similar features made for ladies are also presented. Ladies may want to consider the 16-piece Callaway Women's STRATA Ultimate shown here. It comes with one driver, one fairway wood (#3), two hybrids (#4 and #5), six irons (#6, #7, #8, #9, PW, SW), putter, headcovers and a bag. Ladies may want to consider the 11-piece Callaway Women's STRATA Complete shown here. It comes with one driver, one fairway wood (#5), one hybrid (#5) and three irons (#7, #9, SW), putter, 3 headcovers and a bag. Ladies may want to consider WILSON ULTRA Women's club set shown here which has similar features to Wilson Men's ULTRA but is only for right handed ladies. It comes with a driver, fairway wood, #4 hybrid, (#6, #7, #8, #9, PW) irons, putter, headcovers and a bag. Ladies may want to consider the Pinemeadow Women's Nitrix Pro club set shown here. Like the Pinemeadow Men's Nitrix Pro, it comes with one driver, one fairway wood (#3), one hybrid, as well as #6/7, #8, #9 and PW irons and a putter. If you want to practice your putting at home, you might want to consider the SKLZ Accelerator Pro which is an indoor putting green with ball return. It measures 9 feet by 16.25 inches, and it allows you to train without interruption using the continuous ball return. The true-roll surface simulates real green conditions with a similar stimp reading. It fits in nearly any room or covered patio. Once you start playing golf seriously and need to take regularly clubs and other golf equipment to the green, you soon realize that owning a golf cart is a must to avoid carrying stuff on your back and having to make multiple trips to the car. The role of a golf cart, also called a "caddy" is to carry your clubs during your play so they can easily follow you on the green wherever you go. If you frequently play several hours a week, acquiring a golf cart becomes a necessity. ​A laser rangefinder measures a distance by projecting laser beams to a target and measuring the traveling time taken by the beams to be reflected off the target and returned to the instrument. Nowadays, more and more golfers are using laser rangefinders to measure target distances on golf courses. Laser rangefinders help golfers develop their sense of distance by showing actual distances. Knowing exact distances under changing situations due to wind and a golf course's topography is not only a huge advantage for a golfer, but can help develop his or her golfing skills.